This might just be one of the most fun WeddingWednesday posts so far! If you know me then you know how important it is that we shopped small for our wedding. We LOVED the idea of being able to make each and every step unique and special to us. 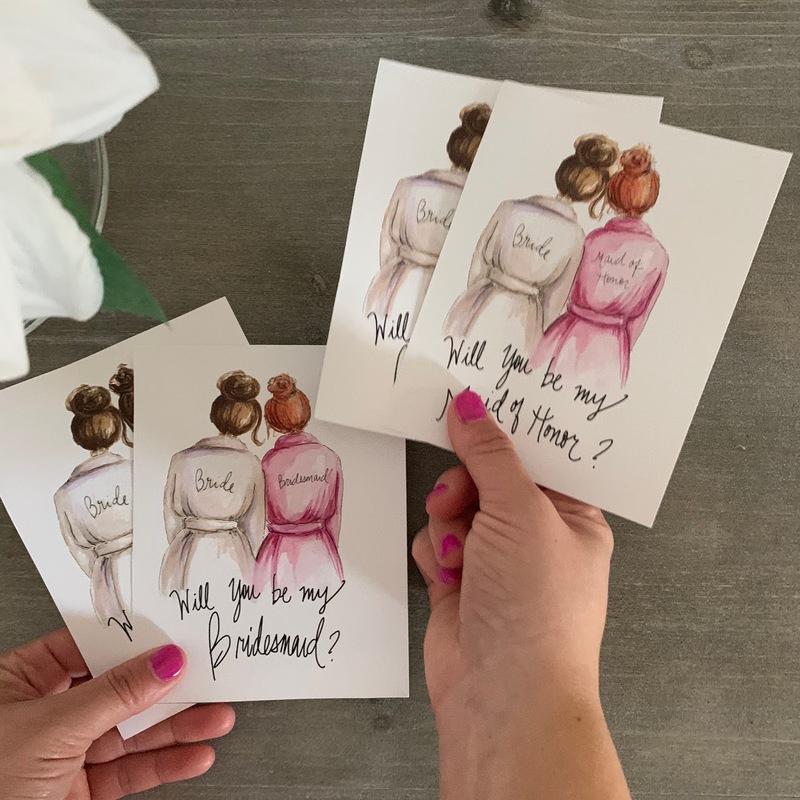 Today I’m excited to share how I asked my bridesmaids. I really wrestled with the idea of having a bridal party and at the end I knew each one of these girls had to be my side. We have 4 bridesmaids and 3 groomsmen, which has turned out to be a great number. All of them are people we are extremely close with and wanted to be by our sides throughout the process and on our wedding day! I knew I wanted my bridal party to feel special from the very beginning, I also needed it to be true to myself. I decided to create a box and ask them with a few of my favorite things. I wasn’t lucky enough to be able to ask four of them in person and that made me sad at first; then I realized all these women are all over the US and distance hasn't changed our relationship. Pinterest had a lot of ideas (which was semi overwhelming) but it gave me a good idea of what I would need to pull it off! but making my own seemed more special and sentimental! I found the boxes and the stuffing at Target and snatched them up! I knew they would be the perfect start to their boxes. The lettering on the boxes was made from this adorable shop on Etsy called TwinandCoDesign who also helped me personalize the jewelry boxes as well. Those cute straws and ties I found at Joann’s. The cups I found at HomeGoods and couldn’t believe that they had enough! That seemed to be a very common thread. Only 3 or only 2! The ring pops were a super easy sell snatched those this year at Valentine’s Day. Last but not least I had the custom cards made for the boxes. I found those on Etsy called aprilheatherart and she has such amazing things you should check her out. Her custom work is incredible and I can't wait to show you her stuff for the bachelorette party. I am beyond thankful to have them by my side on the best day of my life! Just wait till you see the gift bags I created for my bachelorette party! To all my brides out there how did you ask your bridal party?